Oh what a year it's been....a little wrap-up of 2008 in blog-posts. We said good bye to Helena, who died in February of this year. May her memory be for a blessing. David lost his first tooth (and quite a few more, since then actually) and we celebrated Purim. I started Tuesday Torah, pretty regularly, and I went to the Devorah Quilting Kallah at OSRUI. As I prepared for Pesach, I wrote this little piece on the Seder that won me an Honorable Mention in Scribbit's Write-Away Contest for April! (I also won a matzah brie contest....) April was quite a month for me, since I also wrote a post on 60 Bloggers for Israel. I told my favorite joke and talked about why I love Israel. I hosted my first edition of Haveil Havalim, the Jewish Blogging Carnival. I cut off a lot of my hair for Locks of Love and I started growing other things too. I tried to have a quickie (shower) with Amy. I counted Omer and celebrated Shavuot. Plus I went to a wedding and hosted Haveil Havalim again as we packed for camp. Our yearly camp experience was fun but lightly blogged (too much fun, I think, or maybe it was Yael's daily 4am wakeup call). I mourned Ehud and Eldad. We skateboarded the grass, played in the yard, and grew tomatoes. I mused about community. Sammy mused about snacks. Sometimes I took bloggy breaks and enjoyed the summer. Real Simple Magazine published my thoughts on motherhood's most important tool. I sent the boys off to school (with lunch) and I ditched the disposables. I took a High Holy Day hiatus and then got really really bugged. I was part of Blog Action Day and celebrated Sukkot (but really didn't blog about it at all, October was a quiet month here on my blog!). I participated in NaBloPoMo and stuck it out for all 30 days! We celebrated birthday after birthday after birthday in November and survived it all! We lived through history and celebrated with great joy. I was a MotrinMom and a locavore. I shared my Thanksgiving rituals here and here. And in honor of NaBloPoMo, I even hosted Haveil Havalim again! I counted down to Chanukah with a lot of giveaways and I made baked soufganiyot, a first for me. I gave away 2 birthday parties in honor of my own birthday. And now, as the year draws to a close, my eyes and heart are in the East. So what's up in 2009 for the Ima? I'm hosting Haveil Havalim again this week. I'm going to celebrate holidays and visit Israel and go to camp and the quilting retreat. I'm sure I'll rant about something and giggle about other things. Maybe this is the year that the Reading Rabbi will kick off. Or not. I'll talk about world events and about silly things. Summer will return and then autumn again. I might cook or bake or make projects. I am so honored to have you all reading and sharing my life, I hope that somehow, in some way, my blog brings you something....inspiration, or a laugh, or even a little cry. Happy (secular) New Year, y'all. May this year bring blessings and please, please, may it bring peace. See you on the January side! and Jack continues to post updates and share posts from lots of people. Then...yesterday was my birthday, and we spent they day celebrating with a trip to the Milwaukee Public Museum (a great museum, if you're ever in town). They have a permanent butterfly exhibit. My personal favorite part of the Museum is the Streets of Old Milwaukee, a reproduction of the gas-lit streets of yesteryear. I've always loved looking in the windows of all the houses and shops. It was only 10:15am but we popped into the candy store and I bought some Raisinets (health food, right?) and doled them out to my little people. How silly is this: you're not allowed to eat in the museum, but they sell candy. We were allowed to eat inside the shop, so we did. But of all the pics of the weekend, I think this face from Yael wins as my Best Shot of the week. I'm not even sure what it means, but it was too cute to pass up. Stay tuned for the winners of all the Tzedakah giveaways from the past week....and stay tuned for information about Israel. If you're interested, follow the updates of Jack and Jameel, as well as ynetnews and jpost.com....may safety and peace come soon. In case I forgot to link to it, Kosher Cooking Carnival is up here. And Jack is rounding up the Gaza posts right here. Jameel is live-blogging, but he's resting right now. And of course, I'm following #gaza (although there's a lot of misinformation and inappropriate statements there....) and cnn.com and jpost.com and ynetnews.com with great concern. Next week, I'm hosting Haveil Havalim, so get your posts in early, it always helps! Plus, don't forget to comment on my birthday post to win a Birthday Party for a child in Israel. Every so often my birthday falls during Chanukah. When it happens, I get a whole lot of birthday candles! This year, it happens to be the 8th night, so it's quite a display. So, this year, in honor of Chanukah and my birthday, I will give away one Birthday Party to a lucky commenter on this post! The catch: it's not for you. It's for a kid in Israel who can't afford a birthday party, through an organization called Birthday Angels. It's a big bang-up ending to my 2 weeks of Chanukah fun and giveaways. AND....If I get more than 32 comments on this post, I'll give 2 Birthday Parties! So tell your friends, tweet it up, and let's celebrate! It's very clear that the story of Chanukah is a military one. Most renditions of the tale indicate the the holiday is a celebration of a military victory. It's relatively clear to me that the rabbis of the Talmud weren't super-comfortable with a holiday that celebrated military might, especially while they were living in Babylonia (and therefore subject to a foreign power), and so they reworked the story to focus on the miracle of the oil instead. But all of this does allow me the link from the military victory of Chanukah to the present-day Israeli soldiers, many of whom serve at checkpoints, bases, and other various military installations. Standing Together is an organization that was founded to send pizza to soldiers and has expanded to sending coffee, donuts, and other treats and comforts that helps soldiers feel appreciated and cared for. More than anything, the soldiers of Israel are her children, and Standing Together helps remind us of that. So....in honor of one wonderful and very lucky commenter, I will provide Chanukah donuts for four soldiers! Comment away on this post. How do you find comfort when you're away from home? And, if you so desire, click over to Standing Together and make your own donation. Five bucks goes a long way, and if you're in Israel, contact them to arrange to deliver the pizza, coffee and donuts. P.S. The awesome Leora has posted a great edition of Kosher Cooking Carnival. Go check it out! For those of you not familiar with this truly incredible food, soufganiyot are jelly-donuts, deep fried and usually doused in powdered sugar. What could be bad about such a delicacy? And not only a delicacy, but a mitzvah! In Israel, where potatoes are not really native, these jelly-filled-fried-dough-balls are the delightful alternative for latkes (levivot), a food fried in oil. And, since oil is really the heart of the Chanukah matter, oily foods rule the day. This month's issue of Cooking Light had this recipe for Baked Soufganiyot. Baked!? How can you bake something that's meant to be fried? I have no idea. But they sure were yummy. 1. Dissolve yeast in 1/2 cup warm milk in a large bowl; let stand 5 minutes or until foamy. Add remaining 1/4 cup warm milk, granulated sugar, and next 5 ingredients (through egg); beat with a mixer at medium speed until blended (butter will not be completed melted). Weigh or lightly spoon flour into dry measuring cups; level with a knife. Add 9 ounces (about 2 cups) flour to yeast mixture; beat at medium speed until smooth. Stir in 4 1/2 ounces (about 1 cup) flour to form a soft dough. Turn dough out onto a floured surface. Knead dough until smooth and elastic (about 8 minutes); add enough of remaining 1 ounce (about 1/4 cup) flour, 1 tablespoon at a time, to prevent dough from sticking to hands (dough will feel sticky). 2. Place dough in a large bowl coated with cooking spray, turning to coat top. Cover and let rise in a warm place (85°), free from drafts, 1 hour or until doubled in size. (Gently press two fingers into dough. If indentation remains, dough has risen enough.) Punch dough down; cover and let rest 5 minutes. Divide dough into 16 portions, rolling each portion into a ball. 3. Place dough balls on a large baking sheet lined with parchment paper. Cover and let rise 45 minutes or until dough is doubled in size. 5. Uncover balls. Bake at 375° for 14 minutes or until browned. Remove from pan; cool completely on a wire rack. I did not use jam. My oldest child doesn't like fruit-filled sweets (I'm not the hugest fan either) and since I've had soufganiyot filled with chocolate, I know it can be done. I used chocolate pudding. Delish!!! Plus I served up some extra chocolate pudding on the side to dip the extra dough (each donut had a little more dough than filling) into. A truly delightful, if time-consuming, new holiday tradition for our family! Mazon, which means "food" in Hebrew, is an organization working to stop hunger in the world. They do so by particularly linking simchas, celebrations, with helping the hungry. 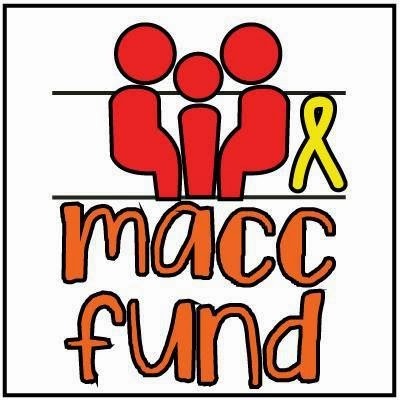 This connection is not new in Jewish life, but Mazon has worked very hard to institutionalize the concept of giving 3% of the cost of life-cycle and other celebratory events to Mazon to help those in need. In honor of the food of Chanukah, I will donate $1 for every comment on this post to Mazon! The first night of Chanukah is tonight, and I wanted to thank you all for joining me on my Chanukah Countdown Party! It's been quite fun for me to give things away every day (even if it was a little stressful) and I thank you all for reading and playing along. Many thanks again to all who played along! Chanukah is here and I've decided to continue the fun. So all week I'm going to be giving away Tzedakah, gifts of charitable contributions in honor of my commenters and readers! It will be a little different each day so come back and visit me. Today I'm giving away a tree. It's partly because trees seem to be on the brain but also because it's always been one of my favorite ways to give tzedakah. Jewish National Fund has been planting trees in Israel since 1928 and their work has broadened and continued over time. Today they engage in amazing work for the Land of Israel. I will plant a tree in honor of one of my wonderful readers. Make a comment on this post. Say something nice about trees, about Israel, about Chanukah...whatever you want! I'll let you know sometime on Monday. You can even choose the forest/certificate (one of the $18 ones, not the $5000 forest, sorry) - go to JNF's website and check out all their great works. Build-A-Bear Workshop is selling a really cute Moose for another holiday. They were very sweet to send me one to tell you all about and it is absolutely gorgeous. It is soft and cuddly and the antlers light up, similar to Bruce, I would imagine. His name is Hal and he and his pal Holly have a sweet little story book that come with them. I think that it is a great holiday gift (and I plan to gift it to my neighbor's little boy even though my kids really love it and want to keep it!) and I do love the whole Build-A-Bear thing -- what a fun activity that gets you a friend at the end! Comments closed.....the winner is Leora, @leoraw !!! Mazel tov! I was so excited to get this CD, Shirlala Chanukah from Shira Kline because I've seen it and haven't yet gotten a copy. I have a pretty nice Chanukah playlist on my iPod, so I was happy to add onto it. It didn't disappoint! This is a cute CD with nice music. Most of it is traditional but there are some great new songs. The first song, Chanukah Bamba....I must admit I thought the song would be about the Israeli snack, but instead it was a cute take-off on La Bamba. My kids got a kick out of it! The kids singing with Shira are not always on tune or on time...which would be fine if they were my kids but they're not. They are slightly distracting from the music. But I like their participation, which invites little listeners to feel a part of the CD. I like her storytelling style, and the way she shares the songs and the story together. It's a great mix of musical styles and will get you moving! Plus a cute comic book about Chanukah, which was a lot of fun to look through. Shira has given me one CD to listen to and then give away to one of you, my lucky readers! Comments will close at 8am Friday, December 19th. Comments closed...the winner is @valerie2350! mazel tov! Join in the Chanukah Countdown Party - feel free to grab my badge above and link back here with your own Chanukah posts! How do you celebrate, what's your favorite observance, favorite tips and tricks, etc...What's your favorite Chanukah music??? Have you met Bruce The Hanukkah Moose? - Giveaway! Day 4 of the Chanukah Countdown Party continues! I am a storyteller. It's one of my favorite things to do anytime of year. I'm always looking for new holiday and Shabbat stories to share. While at first I was skeptical, it's a pretty cute book. It's a common technique in children's books in general, but not in typically in Jewish children's books: animals acting like people serving as all the characters in the book. It is such a freeing idea - if you want to see yourself in the story, you can. Unlike so many Jewish children's books in which the characters are "traditionally observant" Jews, these animals are contemporary and pretty "normal" (except that they are furry, of course). The rabbi in the story is, of course, an owl (isn't he cute?). And Bruce is a cute moose who hasn't grown into his antlers yet. The book is beautifully illustrated, brightly colored and fun to look at. It comes with a CD including an audio version of the story as well as an original song (which wasn't exactly my favorite Chanukah song, but it was enjoyable...click here to hear the song!) My kids love audio books so I know that will be a hit with them. Plus a portion of the proceeds go to planting trees in Israel. All of this adds up to a nice addition to the world of Jewish children's literature! This book definitely works for me. If you'd like to order your own copy of Bruce Bruce the Hanukkah Moose, click over here to purchase. Or, before you buy, win a copy of Bruce Bruce the Hanukkah Moose! The authors/publishers have so kindly sent me a copy give away here. Comments will close at 8am Thursday, December 18th. Comments closed....the winner is....TechyDad! @techydad Mazel tov!!! P.S. 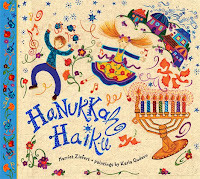 To see and buy some of my other favorite Chanukah books, check out my Amazon Affiliates Shoppe. Last year, I got this great Menorah Hat for Chanukah. I'm really the only kind of person who can truly get away with wearing this hat - it's great Rabbi-wear, if you ask me. I wore it on Sunday morning for Religious School and it got great response. The other kind of person who can look good in this hat (which, I suppose, implies that I look good rather than just plain silly), is my daughter. Actually, the Hebrew word "menorah" just means lamp. This 9-branched menorah is technically known as a chanukiyah, or Chanukah menorah. The term chanukiyah was coined by Eliezar Ben Yehuda or his wife (it's unclear), as they revived the Hebrew langugage as a modern tongue. One of my favorite on-line Judaica stores is PopJudaica. You can, all year long, click on their button over there to the left, to buy great stuff from them. Go ahead, browse around. I can wait. Make sure you look at the Shlep Bag, the Wax-Off Spray, this awesome Menorah Wine Cork, and even this Poker Yarmulke. Great stuff, isn't it? It's a great year-round site. You can even follow them on Twitter. How can you win this adorable stuffed Chanukiyah? Comments will close at 8am Tuesday, December 16th. COMMENTS CLOSED -- the winner is....Reiza, @reizam - Thanks for playing! That's definitely my Best Shot this week. Come back for Giveaways all week!!!! From my delicious. Are you part of my network? It's a great way to keep track of and share your bookmarks. Again, don't forget to click over or scroll down, depending on how you got here! Welcome to my Chanukah Coutndown Party! I'm so excited to be celebrating 2 weeks of Chanukah posts, giveaways, and just general fun. Make sure to check back here every day because I have something great to give away all week and all throughout Chanukah! I am sure that you knew the traditional food of Chanukah is latkes and/or sufganiyot. Latkes are potato pancakes, fried in oil. Sufganiyot are jelly-filled donuts, also fried in oil. The oil is the key, of course, because of the mythology of the oil and its important role in the story of the holiday. Unfortunately, it's not that cut-and-dried - we don't know what really happened, we have two different versions of the story and it's all apocryphal. During a siege of the city of Bethulia (which we know nothing about), the supposedly beautiful widow Judith is determined to save her people by assassinating the Assyrians' general, Holofernes. She left the city with the intent to seduce the general. Holofernes invited her into his tent for a nice meal, intending to seduce her. Judith waited until he fell into a drunken sleep, grabbed his sword, and cut off his head, bringing it in a sack back to her town, which turned the tide of the battle. Hooray! The other version of the story goes like this: Every virgin bride (in the other she was a widow, note) prior to marriage was obliged to sleep with the Assyrian governor (ew). Judith, when it was her turn, fed the governor cheese which made him sleepy and when he went to sleep, she chopped off his head and saved all her fellow ladies. Because of Judith's heroism, in whatever way it occurred, it's customary to eat dairy foods on Chanukah. Another good vegetarian holiday, if you ask me! Oh Nuts Giveaway - $30 gift certificate to anything on their site! They have these really nice Chanukah baskets, and some other stuff too, including these jelly bean dreidels which I think are adorable. (And if you're here and Chanukah isn't your holiday, there are other things for other holidays too as well as coffee, other gifts, and even healthy stuff.) See here what Miriam got from Oh Nuts. You could buy these cute cookies too! Comments will close at 8am Monday, December 15th. Comments closed. The winner is...@kvetchingeditor Chaviva! Can you pray for a bailout? The S.U.V.’s on the stage, a Chevrolet Tahoe, Ford Escape and Chrysler Aspen on loan from local dealerships, were all gas-electric hybrids, and Bishop Ellis urged worshipers to combat the region’s woes by mixing hope with faith in God. Is this really how prayer works? Certainly we can pray for the strength to make it through tough times. We can pray for the ability to help ourselves and others. We can even pray for wisdom - for ourselves and our lawmakers. Prayer, I believe, is within us. God is not a magic candy dispenser, giving us a gumball for a quarter, a bailout for a prayer. Faith must, I believe, be coupled with the inner work of the self and the outer work of culitvating our connection to humankind. May difficult times bring us the power to help each other. May we all be blessed with the prosperity of spirit that will bring us together and uplift us even in dark days. May we find inner peace and outer community. and please consider donating to this DonorsChoose project which is about to expire. Back to blog when I get unstuck. My cousin had a birthday this week, and so I baked him a carrot cake. The list keeps growing of people who love this cake, who hope or expect (um, husband) a carrot cake for their birthday or sometimes when their favorite team loses the SuperBowl. This past summer I suggested to make this cake for a friend's birthday. She protested, "oh, you don't have to do it." Her 7-year-old son came up behind her and whispered (loudly), "Take the cake, mom!" I delivered it on her birthday! Even kids like this carrot cake. Growing up, my Bubbie Rose (bubbie is Yiddish for grandmother) made it for our special occasions or whenever we begged for it! I used to put a piece on my plate on its side and eat it all the way up to the frosting and then eat the frosting last. It was quite a cake-eating-ritual. But Bubbie says my cake is even better than hers...I think she's biased, because she likes me better than cake. I have made a few adjustments to Bubbie's cake. I've replaced most of the oil with applesauce and I'm pretty free and easy with the measurements in general. It always comes out for me. Add the wet ingredients plus the nuts. Put into a greased and floured 9x13 cake pan. Bake at 350 (*325 if using a glass pan) degrees for 45 minutes to an hour. Blend 8 oz cream cheese, 4 oz powdered sugar, 1/4 cup butter, a little vanilla and a splash of milk if needed in the food processor or mixer...spread on the cake and lick the spatula. I have actually made this into a layer cake before but it's just too much work. I frost it right in the 9x13 pan and we never have any leftovers!!! P.S. This week's Haveil Havalim is up over here. It's a good one! P.P.S. Please read my post about this about-to-expire DonorsChoose project! Only 29 days remain on this Donors Choose project. As a new teacher at a junior high last year, I enthusiastically developed an after-school Book Club for Girls. This new extracurricular activity was a smashing success, particularly with bilingual and socially-challenged girls who may not have otherwise joined an after-school club. A group of approximately fifteen girls met weekly to discuss book and life related issues of friendship, diversity, peer pressure and determination. This group of girls, representing a plethora of races, languages, religions and ages, put aside their differences as they bonded over great literature. This project only needs $312 more. If each of my wonderful subscribers (I know there are a bunch of you!) clicked over to the left <---- where the Donors Choose widget is, or clicked on that link above, and gave just a few dollars of your tzedakah money....we will fund this great project, helping girls gain so much from reading. I know there are a lot of causes out there in the world, but I'm hoping you'll help me and these students out here today. It is customary to give tzedakah (charity) before Shabbat begins. So click over today....you certainly won't regret it and it will help out. Thanks so much and Shabbat Shalom! I am so tired of fighting over breakfast. Most of you who follow me on Twitter or Facebook know that my kids have been getting up super-early lately, and then can be crabby. (Me too!) This means that they tend to fight about whatever I offer for breakfast. And I really believe that giving choices just invites problems. Also, we have been going through frozen waffles like crazy and they're not so cheap! So I invented the "Breakfast Menu." Not only did I make a menu, but I now make a big deal about each day's food. The biggest hits are, of course, Muffin Tuesday and Pancake Wednesday. These even have songs composed in their honor. Okay, maybe it's not the greatest picture. But I tried. How on EARTH am I supposed to get a family picture with everyone actually smiling and looking at the camera!? What do you do? My dad took this picture on Thanksgiving and it is a great shot of me and my husband, and even David....but Sam and Yael just don't want to look in unison at the camera. Check out this week's Haveil Havalim, too!